On a Roll? Then Roll Up! Options traders have opportunities and choices that simply are not available to stock traders, and that’s what makes them the choice among professional traders. These advantages can be categorized as hedging, morphing, and rolling, and it’s the art and science of these three that makes options trading so rewarding. One of the easiest, most powerful strategies is a type of roll called the roll-up. If you’re an options trader, this one strategy will immediately improve your profitability. If you’re a stock trader, it’ll convince you to switch to options. 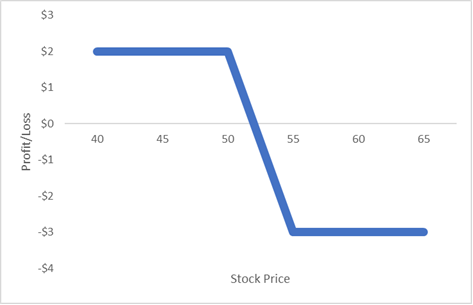 The roll-up is a strategy used for call options where the underlying stock price has risen, and there’s a related strategy called the roll-down that’s used for puts when the stock price falls. Conceptually, they’re the same strategy – just used in opposite directions. When you understand one, you’ll understand the other. For now, let’s just focus on the roll-up. To appreciate the roll-up, let’s first see the dilemma stock traders face. Let’s say you own ABC shares at $50, and the stock has run to $56.50 after a few weeks. Should you take the profit? Or hold on for bigger gains? That’s the big decision for stock traders. They have lots of money riding on the position and get tempted to take quick profits. After all, as the saying goes, “You can’t go broke taking a profit.” The truth is you can go broke taking profits. If you take quick, small profits, it’s a matter of time before you have one big loss, and those many small profits may not cover the loss. To succeed, you must let your profits run. Anyone whose been trading for a long time knows that regretful feeling all too well. You pick up a few pennies in profits, only to find you missed the serious money. Trends – up or down – always last longer than people expect. One of the most dramatic examples occurred in the late 90s when Qualcom (QCOM) rose from $40 to $80 within three months in anticipation of a strong earnings report. It can’t go higher from here, right? Wrong. It did and went straight to $600. Whoops. Any stock trader has seen countless examples like this. Amazon.com, Apple, Nvidia, and Salesforce just to name a few recent ones. The real money in the markets is usually made from a handful of positions, but the problem is that you don’t which ones – or when. With the $50 call trading for $7.10, it may be tempting to sell, but remember, trends last longer than people think. Further, even if you sell for a profit, what are you going to do with the money? You’ll plow it back into the market, so you haven’t really accomplished anything other than switching the risk of the option you sold with the one you bought. Instead, the stock is performing well. Stay on it, but let’s remove some of the risk – and fear. 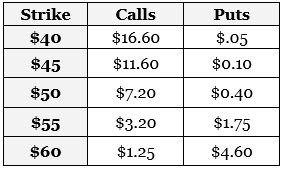 Doing so, you’ve given up a long position in the $50 calls and replaced it with a long position in the $55 calls – you have rolled up in strikes. At the current prices, this will result in a net credit of $4 to your account, or a total of $4,000 for the 10 contracts. Most importantly, notice that the blue line sits above the breakeven line shown in red. Again, that’s because you initially paid $3, but collected $4 from the roll-up. You can’t lose – but you might make more. 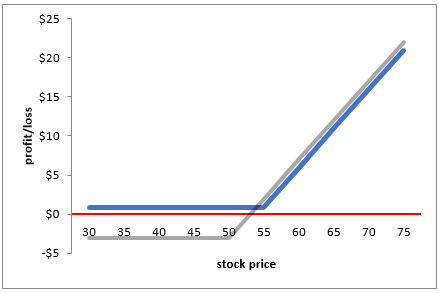 Some stock traders try to do a similar thing by selling a portion of their shares, say half, and then hold the remaining shares. The problem is that you’ll eventually run out of shares. You can only hold on for so long, but that doesn’t happen if you’re using options. A roll-up won’t always shift you into guaranteed territory as in this example. However, each roll reduces the potential you can lose. You can also sell a few contracts and roll the remainder to get you into a guaranteed trade quicker. 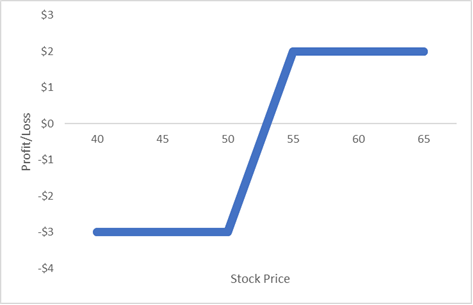 For instance, if the stock was only trading at $54 rather than $56.50, you might sell three contracts and roll seven to get you into a guaranteed position. The possibilities are endless once you see the power of options. Roll-ups and roll-downs are two of the most powerful hedges that long call and put owners can use. They allow you to collect profits while still maintaining the same-sized position. If your stock’s on a roll, roll your options, and improve your profits. Over the next 13 weeks, American Woodmark Corp. has on average historically risen by 8.7% based on the past 31 years of stock performance. The holding period that leads to the greatest annualized return for American Woodmark Corp., based on historical prices, is 19 weeks. Should American Woodmark Corp. stock move in the future similarly to its average historical movement over this duration, an annualized return of 42% could result. Over the next 13 weeks, Daqo New Energy Corp. has on average historically risen by 23.2% based on the past 7 years of stock performance. The holding period that leads to the greatest annualized return for Daqo New Energy Corp., based on historical prices, is 51 weeks. Should Daqo New Energy Corp. stock move in the future similarly to its average historical movement over this duration, an annualized return of 117% could result. Over the next 13 weeks, INSTALLED BLDNG PRODUCT has on average historically risen by 9.7% based on the past 3 years of stock performance. The holding period that leads to the greatest annualized return for INSTALLED BLDNG PRODUCT, based on historical prices, is 2 weeks. Should INSTALLED BLDNG PRODUCT stock move in the future similarly to its average historical movement over this duration, an annualized return of 361% could result. Over the next 13 weeks, Nektar Therapeutics has on average historically risen by 14.9% based on the past 23 years of stock performance. The holding period that leads to the greatest annualized return for Nektar Therapeutics, based on historical prices, is 1 week. Should Nektar Therapeutics stock move in the future similarly to its average historical movement over this duration, an annualized return of 121% could result. Over the next 13 weeks, APPLIED OPTOELECTRONICS has on average historically risen by 24.1% based on the past 3 years of stock performance. The holding period that leads to the greatest annualized return for APPLIED OPTOELECTRONICS, based on historical prices, is 48 weeks. Should APPLIED OPTOELECTRONICS stock move in the future similarly to its average historical movement over this duration, an annualized return of 183% could result. Over the next 13 weeks, Dillard’s Inc. has on average historically fallen by 4% based on the past 28 years of stock performance. The holding period that leads to the greatest annualized return for Dillard’s Inc., based on historical prices, is 47 weeks. Should Dillard’s Inc. stock move in the future similarly to its average historical movement over this duration, an annualized return of 24% could result. Over the next 13 weeks, Yandex N.V. has on average historically fallen by 4.4% based on the past 6 years of stock performance. The holding period that leads to the greatest annualized return for Yandex N.V., based on historical prices, is 3 weeks. Should Yandex N.V. stock move in the future similarly to its average historical movement over this duration, an annualized return of 31% could result. Over the next 13 weeks, HSN, Inc. has on average historically risen by 9.4% based on the past 8 years of stock performance. The holding period that leads to the greatest annualized return for HSN, Inc., based on historical prices, is 1 week. Should HSN, Inc. stock move in the future similarly to its average historical movement over this duration, an annualized return of 93% could result. Over the next 13 weeks, Atlas Air Worldwide Holdings Inc. has on average historically fallen by 5.2% based on the past 11 years of stock performance. The holding period that leads to the greatest annualized return for Atlas Air Worldwide Holdings Inc., based on historical prices, is 46 weeks. Should Atlas Air Worldwide Holdings Inc. stock move in the future similarly to its average historical movement over this duration, an annualized return of 15% could result. Over the next 13 weeks, Enanta Pharmaceuticals, Inc. has on average historically risen by 4.5% based on the past 4 years of stock performance. The holding period that leads to the greatest annualized return for Enanta Pharmaceuticals, Inc., based on historical prices, is 24 weeks. Should Enanta Pharmaceuticals, Inc. stock move in the future similarly to its average historical movement over this duration, an annualized return of 66% could result. Over the next 13 weeks, TC Pipelines LP has on average historically risen by 5.5% based on the past 18 years of stock performance. The holding period that leads to the greatest annualized return for TC Pipelines LP, based on historical prices, is 1 week. Should TC Pipelines LP stock move in the future similarly to its average historical movement over this duration, an annualized return of 61% could result. The New York Stock Exchange (NYSE) is open Monday through Friday, 9:30 a.m. to 4:00 p.m. EST. It closes for official U.S. holidays or if there is some sort of a major disturbance. The majority of U.S. exchanges follow the NYSE’s schedule, however. For more information on when the stock market is closed please review the below dates for 2016. You should also note when the stock market is closed early and not for the entire day. Thanksgiving Day – November 24 *Please note: Stock market is closed early at 1:00 PM ET on Friday, November 25, 2016. Christmas Day- December 25 (Observed December 26) *Please Note: Stock market is closed early at 1:00 PM ET on Thursday, December 26, 2016. In addition to U.S. official holidays, the NYSE does shut down under a variety of conditions, including national emergencies and/or inclement weather. Some examples of this include power outages, hurricanes, and computer failures, which have caused the NYSE to close without warning. When the stock market is not closed you can read our blog here at Candlestick Forum. Here you will see the Market Direction on any given day to assist you in your stock trading decisions. Just be sure to mark the holidays listed above for 2016 so that you are prepared for when the stock market is closed. Interested in additional training at no cost to you? In addition to training utilizing Candlestick Analysis, Stephen Bigalow offers weekly free education to all subscribers as well as additional education for paid members. We realize that there are a variety of trading tactics that can be a helpful part of your trading arsenal, so Stephen invites highly respected members of the trading community to provide additional training to his list of loyal subscribers. Please view The Candlestick Forum Events Calendar to see what is available in the weeks to come. We hope that this information was helpful to you and hope that you will visit us periodically for assistance in trading the markets.